Basket weaving needs dedication and interest and increasing skill and knowledge; it needs feeling and love and honor for the great weavers of the past who showed us the way. If you can rouse in yourself this interest, feeling and dedication, you also can create matchless beauty and help me renew something that should never be lost. 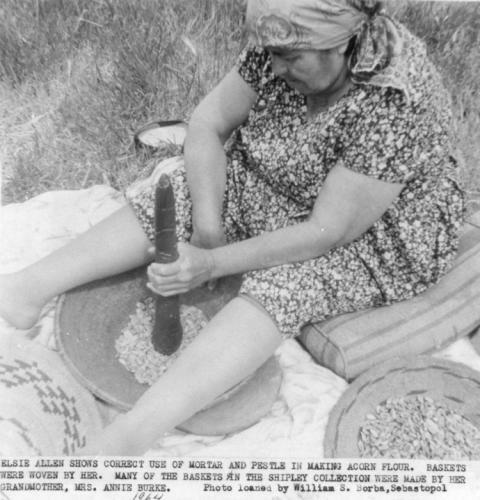 Elsie Allen was a well-known basket weaver of Pomo heritage whose ancestors inhabited the area around California's Russian River - including Sonoma, Mendocino, and Lake counties - just north of what is now the city of San Francisco. This area is especially rich in willows, sedges, and other plants suitable for basket making. Over the centuries, the Pomo people perfected their skill in cultivating, harvesting, preparing, and weaving these plant materials into decorative and functional baskets, passed on from generation to generation. Following in the tradition of the Pomo basket makers, Allen helped to keep this unique art alive, and in doing so fostered an appreciation for Pomo traditions both within and beyond the United States. From the 1840s to the turn of the twentieth century, increasing numbers of white settlers profoundly changed the Pomo way of life and reduced the people to a few scattered bands in the California area. Many Pomo gave up their traditional hunter-gatherer existence and took jobs as farm laborers. Elsie Allen was born Elsie Comanche to two laborers, George and Annie Comanche, on September 22, 1899 near Santa Rosa, California. As a young child Elsie lived an isolated but happy existence with her grandmother near the village of Cloverdale, speaking only the Pomo language. In 1907, when Elsie was eight, her father died. When her mother married her second husband, Richard Burke (who was half Pomo and half English), the new family moved north to Hopland. Elsie Allen began work in the farm fields at the age of ten. In 1910, Elsie began her formal education at the Indian boarding school in Covelo, located in northern Mendocino County, a full 80 miles away from home. Being so far from home, and speaking only Pomo at the all-English school, was a difficult transition for her. Feeling she was an outcast and forced to perform seemingly meaningless activities, Elsie did poorly at school and returned home after a year. At age 13, Elsie began attending a new government Indian school near her home in Hopland. She was able to learn English and continue her education while working in the fields to supplement the family income. After three years, Elsie sought greater opportunities than she had as a farm laborer. A Catholic priest in Ukiah helped Elsie to secure a position as a domestic in San Francisco. 1918 - Chafing against the restrictions her new employers placed on her, she was fired, but then found work at St. Joseph's Hospital in San Francisco during the labor shortage that followed World War I. 1919 - Elsie marries a northern Pomo named Arthur Allen. Between 1920 and 1928 they had four children: Genevieve, Leonard, Dorothy, and George. She returned to work in the fields while raising her family. When her grandmother passed away in 1924, Allen lost an important link to her people's past. Since it was traditional for a woman's baskets and materials to be buried with her, Allen was left with few weaving examples to follow after her grandmother's death. However, Allen's mother, Annie, continued the family custom of basket weaving. Allen had watched both her mother and grandmother make baskets while she was a child and began gathering and preparing materials for weaving when she was older. Her mother had actively pursued the craft of basket making, displaying her works at fairs throughout California. When her health began to decline, Annie adamantly insisted that her baskets not be buried with her, so that they might be enjoyed and studied by future generations. Elsie Allen met with much resistance from her relatives and other members of the Pomo nation over this issue, but she respected her mother's dying wish - and she promised her mother that she, too, would carry on the tradition. At the age of 62, Allen was finally able to devote more time to her basket making. She began to teach the art at California's Mendocino Art Center - to Indians and non-Indians alike. She was resolute in her belief that this art and its associated traditions not be lost to antiquity. Allen maintained the tradition of female influence within the Pomo nation. A female chief exercised authority over women's issues and concerns. Allen contributed to this tradition by maintaining her membership on the Pomo and Hintil women's clubs, working for her people by promoting education, cultural preservation, and Indian rights in the community. Allen's community regarded her as a cultural scholar, and she became known as "Pomo Sage," acquiring an honorary Doctor of Divinity degree. In 1972 she authored Pomo Basket Making: A Supreme Art for the Weaver, which recounts her own life story and documents in detailed pictures and print the fine art of Pomo basket making. Some observers have suggested that Allen's most notable contribution was rescuing the art of Pomo basket making from oblivion. Her baskets are on display in both public and private collections around the world. From 1979 to 1981 Elsie Allen was associated with the Native American Advisory Council, one of her most notable achievements. Through this she participated in the Sonoma State University's Warm Springs Cultural Resources Study, a cultural and historical record of the Makahmo and Mahilakawna (Dry Creek/West Creek) Pomo. Later, the Native American Advisory Council formed a partnership with the U.S. Army Corps of Engineers in the Warm Springs Dam-Lake Sonoma Project. The proposed dam and lake, intended to provide flood control, fresh water, and recreational facilities in the Russian River area, carried with it the potential to destroy indigenous plants that native peoples valued for medicinal, economic, ceremonial, and artistic uses. As a member of the council, Allen contributed to an ethnobotanical mitigation study - an examination of the plant lore of the Pomo tribe and the impact of environmental changes on the area and its people - and was instrumental in organizing a large scale relocation of endangered plants. A new high school was named after her in Santa Rosa, California, opening as Elsie Allen High School in 1995. She died at the age of 91 on the 31st of December, 1990.